According to the Web Index Report, which was published in September 2012, Italy occupies the 23rd world position as far as the incidence of the Web on people’s lives is concerned. In other words, less than an Italian every two surfs the Web each day. This figure does not only show that Italy is a country somewhat belated in what could be called digital literacy, but it is itself quite interesting, especially considering that a year has passed since the Celebrations of the 150th anniversary of the Unification of Italy, certainly the most important historical phenomenon to influence Italian society in recent years. 2011 has been such an important anniversary for Italian national memory and identity. It has meant for Italy the first real chance to deal with the tools and opportunities of digital communication. It has significantly sealed one of the most intense and important decades in the light of historical events and communication in the internet. Events like 9/11, the wars in Afghanistan and the execution of Saddam Hussein as well as the invention of Facebook and YouTube, the mass-production of smartphones, and the affirmation of charismatic men like Steve Jobs , have all contributed to the creation of a fertile soil. The latter has turned the 150th Anniversary of the Unification of Italy into a true media event. This is the first time that the “world of the web” has been able to compete with the traditional media, first among all, the television. There is an issue which deserves to be further investigated and will be mentioned here only in passing, namely that the United States have been at the centre of the public debate in the very same decade which sees them both protagonists and producers of the technology and the means of communication they have imposed on the entire world. Thus, the main characters of the past decade have also become its narrators, defining the ways in which the latter has been told. It is no coincidence that the principal innovations of the first decade of the new millennium, namely, Facebook, YouTube and the iPhone, are American products. Going back to the 150th Anniversary of the Unification of Italy and its proliferation in the Internet, there is another element that deserves to be taken into account, namely its troublesome first appearance, unfit to be “narrated” by the traditional media.1 A comparison with the televised 100th Anniversary of the Unification is enough to illustrate this point. Since July 2009, it has clearly emerged that the narratives constructed around the celebrations of the national unification would have been numerous, controversial and would have needed a more “fluent” means of communication in order to leave room for different nuances and interpretations. The aim was to set the ceremonial voice of the institutions, especially the one of Italian President Giorgio Napolitano, against the voices coming from the common people, hence the voices of Italians themselves. Crucially, the latter were called to speak their mind on such a complex issue as national identity. It is here that one can see how the labyrinthine dimension of the Web implements one of the conjectures of this research. The Web has a democratic structure, whose unique moderation tools have a technological nature, such as Google’s algorithms. Furthermore, the Web has permitted the institutional narratives to be placed on the same communication level. These are the narratives of the so-called “experts of the field”-the both loved and hated historians-as well as those of journalists and opinion makers not to mention the narratives of the “common man”. History, conceived as a narrative of documented events, has been taken, torn, often denied, sometimes re-proposed, and even fanatically celebrated. Such multilayered framework of short stories is made of posts, comments, tweets, thumbs up and shared images. And yet this framework as labyrinthine and confused as it may be, has left an important mark, namely that the history of the Italian Unification is still “alive”, written and read, but also commented and imagined by thousands of Italians, all convinced that contemporary phenomena should be read in the light of the past. If on the one hand, this aspect confirms the inclination towards an historical reading of the present, which characterises European culture in contrast with other realities focused on the connections between present and future, on the other hand, the issue is which narratives are prevailing in contemporary Italy. In other words, no position is legitimate unless it is supported by a suitable historical narrative, placing it in an historical dimension, and wondering on which past, how it is constructed and through which means it is told. This is not the central issue for contemporary historiography, whose relationship with the internet has a primary role as far as interpretation and analysis are concerned. 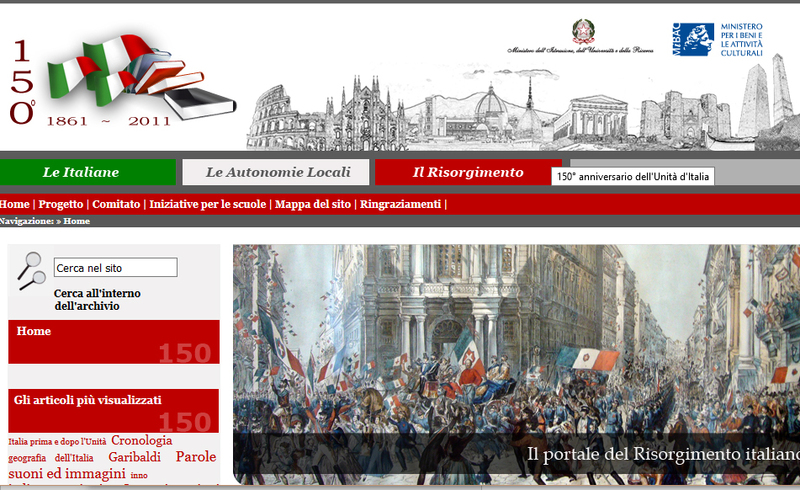 For the aforementioned reasons, I suggest to start from 2011 and from an analysis of phenomena related to the 150th Anniversary of the Italian Unification in order to reflect upon the relationship between history and the Internet. The aim is to follow the thematic thread of the construction of the Italian National identity, a line of inquiry more and more entangled with Italian contemporary history. Even so, embarking on such a virtual debate does offer interesting impressions/suggestions. The issue of political, national and local identity is not only a fertile soil for contemporary historiography, particularly inside of the European debate, but in its religious and historical dimension-consider the survivors of the Holocaust, the Italian partisans, the protagonists of the 1968 protests and so on- it is a fundamental instrument to understand the relationship between history and the Internet. What are the Facebook profiles and the blogs of so many famous strangers if not a public affirmation of one’s identity? And is it not true that the entire mechanism of social networking is supported by the logic of mutual identification and swapping of identities? The celebrations for the Unification offer a good opportunity to reflect upon the issue of memory and identity, perhaps the most complex, but also central to contemporary historiography. The multilayered nature of the Internet allows for a study of the elusive contemporary identity. The latter is grounded in a necessary yet distorted reading of the past. The mechanism of mutual identification and shared interests between Internet users is at the root of the “social” dimension that has marked the Web in recent years and moves towards a shared interpretation of present facts and past memory. The affirmation of identity often prevails on the narrative, distorting the memory and yet turning it into the first element of the encounter of people who are geographically and culturally distant. What weight does History have in this context? What shapes do the narratives take on? My challenge is to provide answers, incomplete as they may be, in such pioneering research, stemming from the following questions: which History do the Italians tell themselves? What are the main issues discussed? The first aspect to be investigated is that of the digital sources available in the Internet. According to the Web index Report, only 0,293 % of Italian institutions recurs to the Web for its services. The institutions that deal with historical research, archives and databases for instance, are probably more web-oriented if compared to the national average. In fact, they have embarked on important operations concerning the digitizing of Italian archives. During the Unification celebrations, these institutions did have the economic opportunity to start new projects to implement documentary data, and yet they have been object of increasing attention by the public opinion in relation to the possibility of preserving and modernizing such heritage. A few figures are necessary to have an idea of the huge amount of data we have to deal with. The Central Archives of the State own 20,000 downloadable files containing important documents and pictures going back to World War One and Fascism. The Istituto Luce has digitized more than 400,000 downloadable pictures and 4,000 hours of video-documents available in streaming. The ANPI (National Association of the Italian Partisans)has published a catalogue online with more than 3,000 biographies of men and women fighting for the Resistenza and available through different research criteria. What emerges clearly from this information is that the official narrative of History though online documents is a biased account, temporally placed almost exclusively in the 20th century and focusing on three thematic areas: World War One, Fascism and the War of Liberation. These great themes intermingle with the memory of the Holocaust, the post-war role of women in Italian society , and the world of economy and job. It is here important to highlight that the Internet user who chooses digital sources for a research on Italian history has a limited scope. Other than institutional sources, History is told by historical magazines, certainly constituting the first approach of the ordinary internet user who needs to find historical subjects in the Web. If one analyses the Italian historical magazines available online, one will realise that they are helpful for scholars who look for specific sources. Nonetheless, if one recurs once again to the data obtained through the Web Index Report, one will notice that only 60% of the Italian contents is to be found in the Web. If one is to trust this figure, the result is that in Italy only 60% of historical contents passes through the Internet before it enters debates and is made known to the public. This figure is even more realistic in the light of an analysis of the historical magazines online, which often cover the function of advertising the paper versions. These magazines have a partial approach if compared to the number of publications in the field of historiography and are “lukewarm” as far as the debate among scholars is concerned. And all of this happens despite the tools available through the Internet such as comments, forums and content sharing. A preliminary remark should be made before entering this area of study, that is, that one is entering the “mine field” of the so-called public use of History. Therefore History is not a subject of study but a tool to retrace, rewrite and create collective identity ex novo. History is read and remembered as an enormous collective biography inside of which one is to spot the traces of a group identity, no matter whether the latter is a national community, a political party or simply a group sharing a public interest. How and by whom is History narrated in the Internet, exploiting its digital potential? There are numberless sites on the narration of History. In addition to the rich amount of information made available by Wikipedia, almost all the main events of contemporary history have a site dedicated to them: from World War One to the Cold War, the Leonardo chronologies to the portal of the concentration camps prisoners, the gathering of data and information prevails on the interpretation of facts. In this case as well there emerges a vision of the Internet more as a means to retrieve information rather than a place for a debate. The approach of the few bloggers who deal with historiography online is completely different and is the main source of historical debate in the Internet. Their merit is to keep alive the memory of facts and historical events reputed to be interesting in the contemporary debate as they enable that connection between past and present which sees, in Benedetto Croce’s terms, all historiography as contemporary history. Let us foreground the most interesting cases. The best known historiographical blog in Italy is Dino Messina’s La nostra storia (Our History) which belongs to the Corriere della Sera cloud. Dino messina is a journalist and a historian. He is a respected and good writer and his research included re-enactments of historical facts and characters and book reviews are all to be found in his blog. His attention to the great themes of contemporary Italy unravel his journalist approach to history whilst his solid background in historiography shows his expertise in the subject. Stefano Azzarà, a researcher of the University of Urbino, is the author of a personal blog called Materialismo storico (historical materialism). Stefano Azzarà searches for the link between past and present and works on a daily basis on articles and book reviews. In turn, with his blog Storia@ Mario Avagliano is an intellectual who dwells between the dimensions of journalist and historian but whose expertise is very specific: militant anti-Fascism, the deportation during the Nazi occupation and the Resistenza. From 2009 to 2011, BlogStoria has been active. It is a press review blog particularly concerned with the preparation and the celebration of the 150th anniversary of the Unification of Italy. This is my blog in collaboration with Yuri Guaiana and we are two young scholars affiliated to the University of Milan. If one enters the difficult and almost unexplored field of social networking, Facebook is certainly the most used means to convey historical information. Conversely, Twitter has a larger potential, out of its structure which powerfully enables to link events, people and places, as demonstrated by the ambitious Alwyb collision project for World War Two. Indeed, according to Audiweb, Facebook has 20,9 millions of users against the 2 million using Twitter. Where can one find History on Facebook then? In the first place, on the page dedicated to historical characters such as Garibaldi, Mazzini, Vittorio Emanuele II and Benito Mussolini. All the protagonists of Italian history have a page of Facebook. There emerges a reperesentation of History as if it were made by few great men, known to all Italians. These men are metaphorically acknowledged as symbols of a page of Italian history. This results in a “pop” reading of Italian history, turned into a simple-minded, mythical representation of individual characters in place of an analysis of roles and events. On the other hand, choosing a Social Network like Facebook over Twitter to discuss History entails a communication based on the identification with a historical character or event and not on the exchange of knowledge and interpretation. The ensuing debate cannot be but sterile, un-historical and politically biased where the reading of History is subordinate to political brawls. A typical mechanism of social networking and of Facebook in particular is the content sharing, perhaps the most suggestive device made available to the public. Mark Zuckerberg’s Social Network is based on the logic of identification. Indeed, Facebook does not favour a dialectical exchange of ideas, but it fosters the logic of mutual identification and, even, its opposite: examples range from thumbs up and content sharing on one’s wall to the refusal of “friendship” with people who have different interests and passions. Consequently, one does not talk of History on Facebook, rather one shares contents, especially images and slogans such as “Yes, I like it, I see it in this way, this is the history page in which I can identify!”. The 150th anniversary of the Italian Unification has been the first celebration to privilege these new media over the traditional ones, also because the institutions have been reluctant to monopolise the debate, giving space to the voice of historians and society. Internet has not only made this possible but it has also amplified its effects: bloggers, scholars and “citizen-journalists” have commented on events, reviewed books and suggested interpretations of historical events. Through Facebook, key characters and events have been selected in order to be remembered and reinterpreted in the light of contemporary society’s demands. A couple of examples are necessary. To begin with, the undying Social, National, Popular and Revolutionary understanding of Giuseppe Garibaldi demonstrates that a good portion of Italian society expects a radical change coming from below, but more rooted in myth than in reality. Secondly, the rediscovery of a character mainly forgotten by society and the institutions, Carlo Cattaneo. The latter has become a recognisable symbol and the authoritative father of the federal State in Italy. The celebrations along with the nature of the new media and the identification/contraposition mechanism furthered by Facebook have enabled the labeling of Risorgimento heroes onto characters far from the Italian Unification events. This original continuum has challenged spatio-temporal boundaries and the cause-effect logic typical of historical narrative, feeding on the semantic connections between historical facts and characters commonly seen as distant from each other. For instance, during the 150th Unification anniversary, the struggle against the Mafia has assumed the status of a central public narrative as well as foregrounding Giovanni Falcone, Paolo Borsellino, and Peppino Impastato as the new heroes of the Unified Italy, placed at the same level, and even more popular, as the Fathers of the Nation. Conversely, if on the one hand the 150th anniversary has been affected by a good portion of the world of politics and public opinion, especially in terms of a federal view of Italy and a somewhat hostile tone towards a Unified Italy, resulting in the division of Italians in two contraposed communities who have autonomously elaborated their own myths and symbols. The forced reading of Giovanni falcone has become public opinion’s major and most intelligible response to the complex issus of the process of national identification. Hence, historical characters and events are reduced to media function of symbols representing issues, thereby losing their complexity, the self-same complexity laboriously reconstructed in decades of historiographical classes. They have even been reduced to icons for an agiographic reading of the national history. On the other hand, though strangers to the logic of scientific research, the Web has fulfilled the role of a litmus paper to read which thematic knots are left unsolved in contemporary Italian society and with which elements they are linked together. The semantic map that the Web builds each day between apparwently distant elemtsn is therefore a valuable tool for the historian wondering on the birth and development of national identities. Thus, it is not the reassuring pathway of a spatio-temporal reading of History that leads to the analysis of n ational identities in contemporary history, but it is the unleveled road of a network of meanings circling around key words in a a-temporal and a-historical dimension. It is a most difficult pattern for the historian must carry on contributing as well as being wary of it, thereby offering updated interpretations of the past which are the aim and the beauty of historical research. 1It should be noted that 2009 is the year when the case for the Unification “exploded” and that there were people who even opposed the idea of celebrating such an important event.